Dublin, Monday October 23rd 2017: An Taoiseach, Leo Varadkar TD, Minister for Health, Simon Harris TD and the Mayor of Fingal Mary McCamley joined teams from the Children’s Hospital Group and the National Paediatric Hospital Development Board at Connolly Hospital today to mark two significant milestones for paediatric healthcare in Ireland. The official sod turning for the paediatric outpatients and urgent care centre at Connolly Hospital took place and it was followed by the announcement of the name for the new legal entity which will include the new children’s hospital, the two paediatric outpatients and urgent care centres at Connolly and Tallaght Hospitals, and the three existing paediatric hospitals. It will also, in time, be the name for the clinical network of paediatric services in Ireland. The new name is – Phoenix Children’s Health. The official sod turning marked the commencement of construction of the 5,000M2 paediatric outpatient and urgent care centre which will be called Phoenix Children’s at Connolly. This new facility will be operational in the summer of 2019 and will be followed in 2020 by a twin facility at Tallaght Hospital. Enabling works have started in Tallaght and an official ground breaking will take place there within weeks. Following the sod turning ceremony at Connolly, the name Phoenix Children’s Health was revealed. The name was selected following a nine month comprehensive and inclusive process involving staff of the three children’s hospitals, the paediatric units of the regional hospitals and the children’s hospital group. Children from the Youth Advisory Council (YAC), as well as current and former users of acute paediatric services and their families, also participated in the naming process. Following more than 300 submissions of suggested names from staff and service users and a selection process overseen by a Naming Steering Group*, the name was selected and recommended in May 2017 to the Children’s Hospital Group Board, who were proud to endorse it. Participants in the process were asked to suggest a name that reflects the values and vision for paediatric services; a single, memorable and descriptive word that is easy to read and pronounce and is inclusive and relevant for all members of the community that the services will support. Another requirement was that it should be easily translated into Irish. The chosen name originated from a staff suggestion and performed well against the criteria set. The new children’s hospital, which is currently under construction, will be known as Phoenix Children’s Hospital Ireland. It is central to a clinical network of paediatric services to be operationalised and called Phoenix Children’s Health. The centres at Connolly and Tallaght Hospitals will be known as Phoenix Children’s at Connolly and Phoenix Children’s at Tallaght and will provide paediatric outpatient and urgent care. Taoiseach Leo Varadkar TD said: “The new Children’s Hospital project represents the most significant healthcare investment ever undertaken by the State – one that will have an impact on children, young people and their families in Ireland for decades to come. The two new centres at Connolly and Tallaght Hospitals will be an integral part of the new children’s hospital project and will be of significant benefit to the people living in the local area, bringing paediatric services to the thriving communities in Blanchardstown, as well as providing outpatients and urgent care for children in the Greater Dublin Area. “It is wonderful that we are announcing the name on this important milestone day. With construction under way on the new children’s hospital and now also on the paediatric outpatients and urgent care centre at Connolly Hospital, we are continuing to make progress. 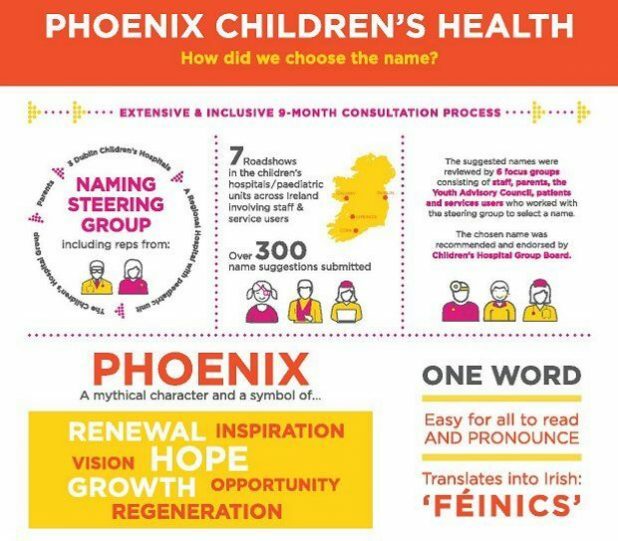 Our new name, Phoenix Children’s Health, represents renewal, the birth of opportunities, regeneration, vision, hope and inspiration. The ability to deliver our services is 100% dependent on the talent and commitment of our staff and therefore for the name to come from within the staff community is fitting, as it is this name that will define the services in years to come,” she said. Today’s sod turning event marked the beginning of construction on the 5,000M2 paediatric outpatients and urgent care centre, which will be called Phoenix Children’s at Connolly. It is expected to be completed by the Summer of 2019. More than 82,000 children and young people will be treated at the two outpatients and urgent care centres every year for planned outpatient appointments and for urgent (but not emergency) care. Children that require emergency or specialist care will be cared for in the existing children’s hospitals and then at the new children’s hospital when it opens in 2022. This new model of care will ensure that children are treated as close to their homes as possible, as is considered best practice clinically, and it will also support the delivery of more efficient services. Putting “Che” on a stamp? Why not Stalin? There really was no difference.